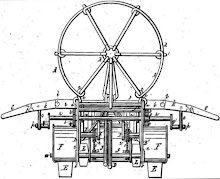 Last month, Ken Akins, great-great-great grandson of Micajah Clark Dyer, discovered a hitherto unknown article in the Athens Banner-Watchman newspaper archives, dated April 28, 1885, about Clark's flying machine. The article is in the weekly edition, No. XLIV, Vol. 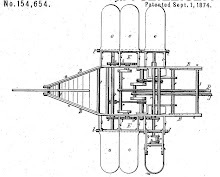 XXXI, and it confirms what we have always heard through word-of-mouth stories handed down through generations that Clark had the knowledge for building a more advanced flying machine than the one described in his 1874 patent, but that he did not have the finances to complete the work. One has to wonder what more he added to his design in the 11 years between the patent in 1874 and this article about his search for finances in 1885. Most likely he added propeller(s) because we know about his drawings on the flyleaf of the family Bible. Also, he said in his patent that the plane could be powered by steam or “other motive power,” so details of how he planned to do this may come to light eventually. Clark would have been nearly 63 years old at the time of this 1885 article, and he lived another six years afterward. Hopefully, we will continue to learn more about what the status of his design was at the time of his death as further documents are uncovered. His neighbor, John Rich, who wrote the letter to the editor, makes some interesting comments about Clark: "Mr. Dyer has worked thirty years on his machine. He is not crazed, but is in dead earnest, and confidently believes that he has solved the problem of aerial navigation. He is not a crank nor a fanatic, but is a good, quiet citizen and a successful farmer." Here's hoping an article will be uncovered soon that reports the testimony of the people who observed his flights in the 1880s, because we have word-of-mouth stories from at least three witnesses, handed down through the years, who say they saw him fly his machine over his farm in Union County. Perhaps also documentation will be discovered of where his original patent and aircraft went. Lack of newspapers and cameras in the area during that period have made documenting this remarkable piece of history difficult with the passage of time.